NES Kanshaku tamanage Kantarō no Tōkaidō Gojūsan-tsugi (JPN) in 08:31.18 by goofydylan8. In Kanshaku tamanage Kantarō no Tōkaidō Gojūsan-tsugi (かんしゃく玉投げカン太郎の東海道五十三次), you play a fireworks-maker traveling the Tōkaidō road. 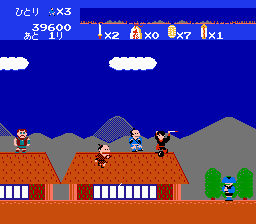 The game actually bears quite a resemblance to the actual geography of the Tōkaidō road; famous landmarks, rivers, and flora types are reproduced as well as they can be given the limitations of the Famicom. The game is quite difficult -- the hero is slow moving and hard to control, and your only weapon is an endless supply of fireworks. The author's comments detail the methods used as well as explaining all of the various baddies encountered during this quest.